Wilsco triangular fuel cell – 21 Litre. Midcoast Marine sell a variety of SLSA approved fuel cells. The most common shape and capacity is triangular – 21 Litres, and concertina shape – 25 Litres. The fabric comes in a limited range of colours. Whilst black is not the perfect colour for our harsh summer temperatures, Midcoast Marine prefer to use the cooler ,more heat tolerant yellow fuel cell fabric. To offset the often extreme conditions these fuel cells have to operate under an over pressure relief valve is being trialed to reduce the over pressurizing and consequently rupturing of the fuel cells. This over pressurizing is a direct result from being left in direct sunlight, excess air not expelled from the fuel cell, or through impact. 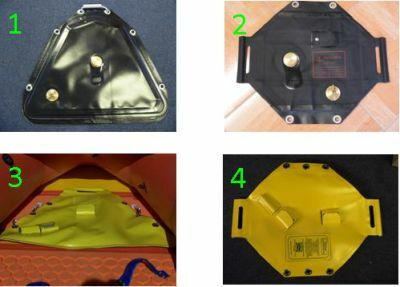 Surf rescue require flexible fuel cells for safety reasons, so methods to reduce damage or injury will always be ongoing, always treat fuel cells with care.